How mom’s can plan for family sport weekends. 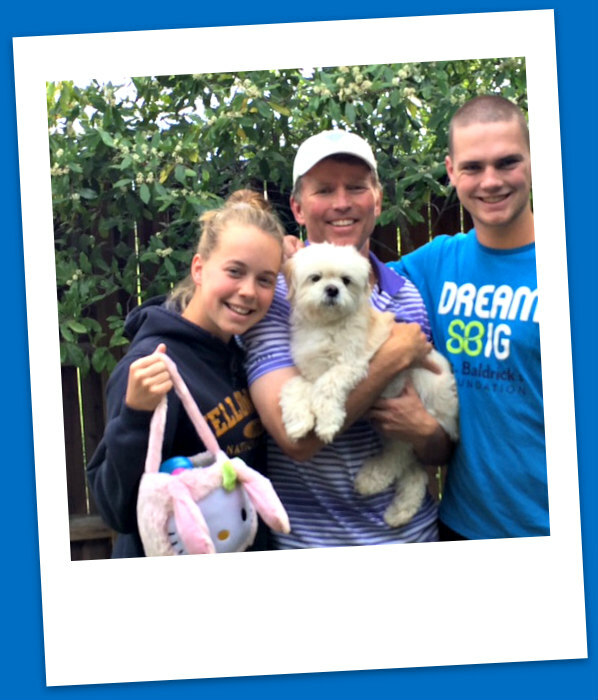 Even though my kids are 15 and 18, they still love hunting for candy filled eggs in the backyard. This year we had to have our hunt in the afternoon because we had just returned from a 4 day trip to Arizona to look at colleges. I had bought a couple bags of jelly beans in the grocery store Sat in AZ so I’d be ready to roll Sunday! The kids are super competitive and ran as fast as they could around my tiny yard to see who could get the most eggs! Funny and true. I traveled every weekend in March- mostly for soccer and the last weekend for college tours. This is a normal part of my life. Both my kids did(my son just stopped) competitive soccer which means lots of travel. This last month was all by car for soccer and by plane for the college stuff. When I drive, I plan to take all my goodies to set myself up for success. This means my vitamix, baking cocoa, protein powder, powdered peanut butter, rice cakes, jerkey and apples. I also pack bars, dried fruit and rice chips/cereal for my girl. This way we will never be hangry and have the comfort of home in a hotel room. I know it’s hard to travel- you never know where or when you’ll eat, what restaurant you will go to but you can control some of it. As a Venus girl, the hotel all you can eat breakfast buffet does not even appeal to me. And I’ve become such a coffee snob, I even bring my own coffee and French press! Let’s face it- there are some non negotiables. I will not settle for hotel coffee. It gives me a headache. There’s always hot water, so I just use my French press. I’m not much of a breakfast person anymore thanks to Venus but do love my morning coffee. One of my favorite drinks is protein powder blended with coffee after a workout. Great way to get your protein in and enjoy a delicious latte/mocha without all the added sugar you’d get at a coffee shop. If I can bring my vitamix, it’s great. If not, there are protein powders that stir into coffee that still taste pretty darn good. But Venus sisters, I’m telling you, if you’ve never tried this- you have got to do it! Blender, protein powder, hot coffee- blend for 20 seconds or so. It will be frothy and delicious. I also try to plan my workouts when I know my kid’s schedule. With my daughter’s soccer team, we always drop the girls off an hour before the game for warm ups. That’s a perfect time to move. I was recently in Las Vegas for soccer and there was a huge walking path around the soccer complex. As well as a park. So I was able to get in 2 park workouts using a bench and some swings tabata style as well as get lots of steps in for the day. What can you do with a bench you ask? Step ups, push ups, tricep dips, squats, Bulgarian split squats, planks bringing your knees to your elbows….. with the swings you can put your feet on the swing and do knee tucks or a pike, a modified pull up, a moving plank, a Bulgarian split squat, and the list goes on and on. I know most moms stand around and talk. To be honest, after driving for 9 hours one way and knowing I had to drive 9 hours home, I wanted to move as much as possible. Even walking felt good. There was another mom on the team who was heading out for a run as we(my husband is a good sport and likes my crazy workouts) were starting our park workout. We were talking afterwards at the game. She commented that she heard a mom say, this season has just been so busy, she had gained 15 lbs. The gal I know took the words out of my mouth and said-just what I was thinking- hey, we’ve got an hour before every game- use it and move! The choice is yours. This past weekend in Arizona, we stayed at a friend’s house. It was gorgeous weather and perfect for an outdoor workout. One day my husband and I found one bench and a super small hill- we ran mini sprints and did tabata for 25 minutes or so. The tabata timer is awesome and gives you a quick (but painful) workout anywhere. 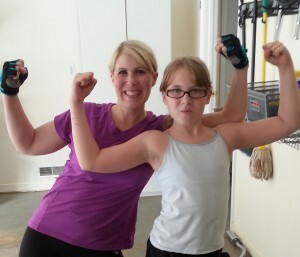 The following day, my daughter and I got to workout together. One of us ran down the road and back while the other did a strength move. I was just happy to be outside and moving and anytime I can workout with my girl, I am happy! I’m certainly not perfect by any means. I overeat at times as well as enjoy the occasional adult beverage. But, I always feel best when my body is moving. Traveling is tough. It’s tiring and can lead to bad choices- I know this first hand. Being exhausted never leads to good food decisions. All we can do is our best. Travel is just a part of life. Some trips go smoothly, some are just hard. Planning what you can is a huge help. As well as planning your workouts. There’s not always time, but when there is- make yourself and your health a priority. You will never regret a workout. P.S.- Tabata is a workout where you work hard for 20 seconds and rest for 10 seconds for 8 rounds. The point is to try to get the same number of reps for each set. If you haven’t tried it, you can download a free timer on your phone and have some serious fun! What is Venus Coaching and who is it for? I have answered a few questions lately regarding Venus coaching and how it differs from our Venus Immersion. Venus Immersion is comparable to a “do it yourself” home project. You know it will take you a bit longer than a contractor but it will save money and you will learn the basics along the way. The other benefit is that you have access to Venus training programming much longer than a 12 week period along with access to all the uncensored podcasts. Venus coaching is comparable to hiring a contractor for your home project. You want an expert so it gets done right the first time or maybe you have a special case. Other reasons may be that you have no background knowledge in fitness or your time is valuable so you want to cut to the chase. A coach will get your background and prescribe a nutrition and training regimen based on your needs. All the coaches do things a little differently based on their personalities. You can request any one of the coaches and if we have space we will accommodate your request. We all touch base with clients weekly and take client biweekly progress reports. Based on that, a coach will modify programming for the client. Clients can email their coach at any time with questions or concerns. I like to talk to my clients face to face so we Skype if the client desires, some of the other coaches do as well. She did a fantastic job, and these before and afters only capture a portion of her total transformation. 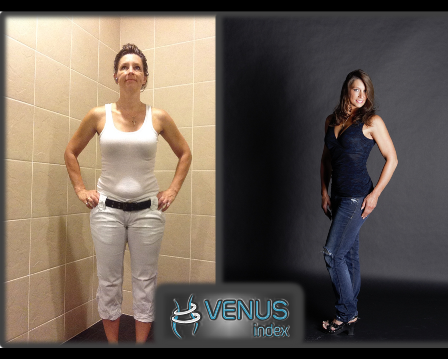 Sharon completed one round of 12 weeks with the Venus Factor system before the contest started. I stumbled across this program on FB and watched a portion of the video, then deleted it. A couple of weeks later, I came across it again. I know things happen for a reason, so I decided to watch the entire video and haven’t looked back since! My experience with Venus has been amazing! I’ve had a few setbacks and have had quite a bit on my plate. I’m opening a new business in two months, started a class that is very demanding of my time, have a full time job, a part time job and then I had to fit in a diet and exercise regime. I wasn’t always able to maintain self control as I love my sweets but that’s the beauty of this plan. You can have what you want as long as it’s budgeted in! However, if I fell off the wagon, I’d just get back on! The exercises were my favorite of all! I used to use workout videos and they got VERY boring. These workouts were always different, very challenging and had instructional videos to watch if I didn’t know how to do it. I NEVER missed a workout, ever! I may have had to do them on different days than I had planned and even sometimes back to back days but NEVER missed a workout! The best part was I could watch my soaps on TV AS I worked out. (I am quite the multi-tasker! Lol. Gotta use my time wisely, I’m busy!) Since I’ve started, I’ve actually inspired others, most importantly, my 18 year old daughter and that is soooo exciting for me! 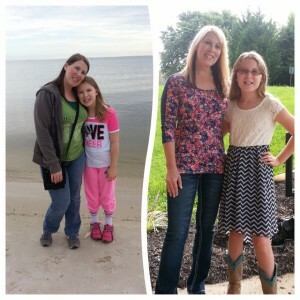 ME, an almost 49 year old, in menopause and a mom of an adult…an inspiration to others? Wow!!!! I weigh less now than when I was 29 and I’m positive I have more muscle now than I did then! This is definitely a program I will use the rest of my life. It’s the only thing I’ve used that made sense and that I’ve seen results with that I know I can actually do long term. Although I am pleased with my results, I feel as though I could have done so much better had I not been so stressed with so much on my plate and a little more self control. However, I do know in my heart, I will continue to get better after the contest. I’ve only just begun! Thank you Venus! Sharon lost 4.25 inches from her waist in only 12 weeks! Sharon looks so confident and happy! Sharon was a joy to interview and she has some wonderful advice to pass on to the next round of Venus contest participants. Listen to Sharon’s interview here. 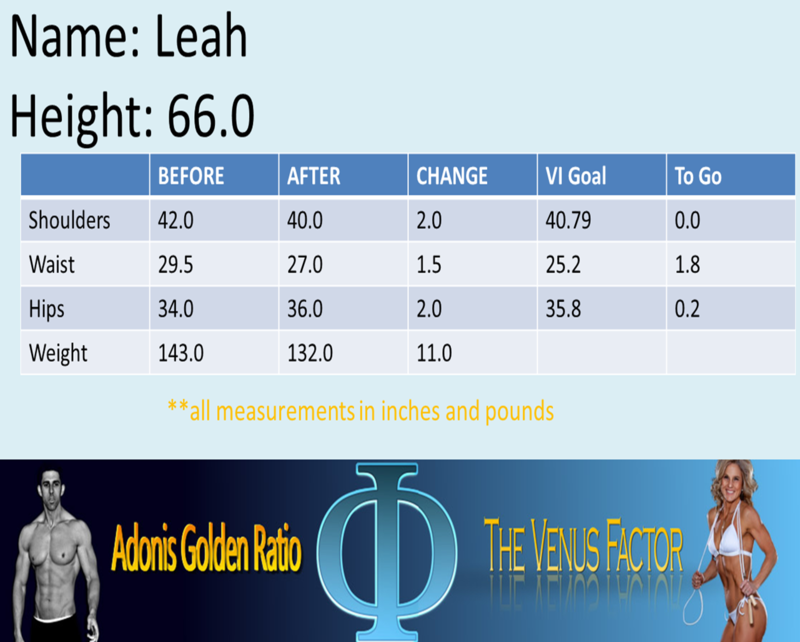 Leah’s stunning transformation using the Venus Factor system in only 12 weeks! 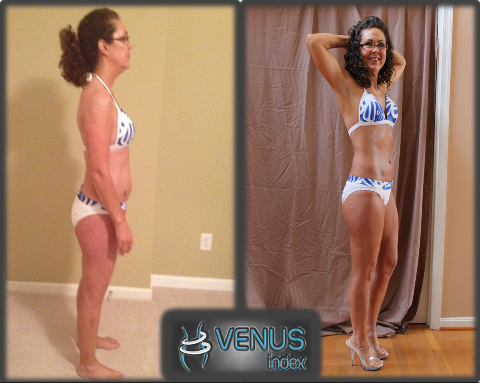 Leah placed in our recent VT12 Venus Transformation Contest. She did a phenomenal job and her results display the hard work she put in. Leah brilliantly navigated through postpartum recovery and breastfeeding during her stunning transformation. I am forever grateful for the Venus Factor and its community as my life has been forever changed! Little did I know how simple it was to have the body of my dreams, I only wish I found this sooner. I have always had a love for exercise and grew to find a passion in weight training. My weight started to change suddenly as I hit my thirties. I thought, maybe this is age related? Or because of a new relationship or both! It just started to go downhill from there. Many major life changes caused my weight to continue to escalate fast and seemingly out of my control. I decided I needed some help as my workouts just were not cutting it anymore. I enlisted a personal trainer at my gym and worked out hard. That was the most intense exercise ever and I hated it! But I did it faithfully trying my hardest to get the increased 40 pounds off. I ate healthy and worked out three times a week and barely lost weight. I managed a total of 15 pounds down in 5 months. Hardly satisfying after all that effort. Then I got pregnant, up another 45 pounds! It was depressing. I worked out my entire pregnancy, I ate really healthy. And I hoped the weight would fall off after my daughter was born but it stubbornly did not. Yoga, stroller fit, weight training, yet my weight seemed stuck. Many people agreed that it was just part of becoming a mom and never to expect to have my flat stomach again. I just could not accept that outcome and could not help but notice that this was not true for everyone. There HAD to be a way! Then I came across Venus Factor “accidentally” through an ad and decided to check into it. The concepts just made sense so I decided to take a chance and try it out. I had nothing to lose except the weight. When I listened and read all the material it just clicked and I immediately gained insight to why so many of my efforts were failing to work. I started right away and immediately started to see it was working. I began to LOVE my workouts more than ever before and now I have a lifestyle that is so effective that it makes it so easy to maintain. I love that I can eat the foods I want and just pay attention to how much and when I eat it, adapting to normal life rather than living abnormally. Once you can experience for yourself and know why something works it’s hard not to do it. All the guesswork is gone and now I have a way of life that gets me the results I desire. At times going through the process there was doubt, even despite some serious weight loss and even still I have moments that I need reassuring. But I have the community of women to talk with and get their insight from and ask questions and this is truly priceless. They all understand what the process is like and had the same doubts and experiences yet are successful. They helped keep me motivated and focused during my weak points. The best part is I have reached results in my weight and physique that I didn’t even think or dare to dream of having at this stage in life. I have surpassed my “ideal” weight I thought I wanted and I fit smaller sized clothing than I can even remember. Ultimately, I feel more geared up for success in every area of my life after accomplishing this goal. If I can do this, I can do anything! Thank you Venus Factor and to all the Venus ladies, I am a changed woman!! 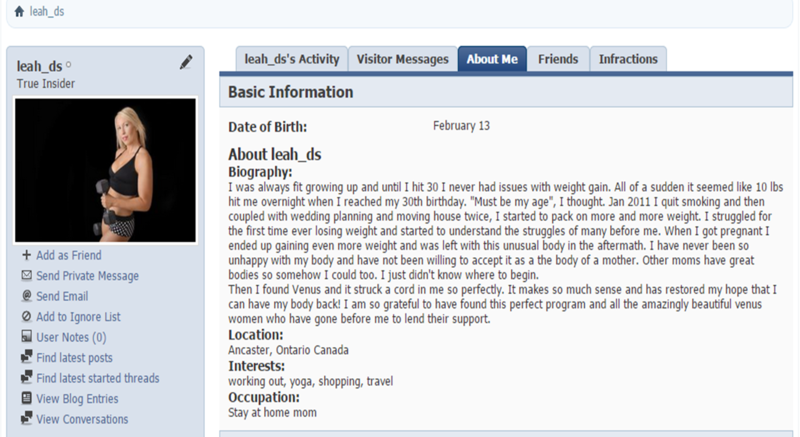 You can find Leah active in the Venus community and read her blog! Leah is active in the Venus community! You can listen to Leah’s story below where she tells exactly how she did it. She had an amazing transformation in only 12 short weeks. What things had you tried in the past? Many years ago at my heaviest (close to 200# after the birth of my second child in 1989) I had joined Weight Watchers and was able to get down to about 160#. Throughout the years since then my weight has fluctuated between 135-160, once I was able to get back down to 125 taking Metabolift by Twin Lab but I was sick to my stomach and had headaches all the time so I stopped taking it and in less than a year my weight was back up to 140. Even though I have always been active in a variety of ways including reaching a 1st degree black belt status in Tae Kwon Do I would never really consider myself actually fit, in fact my lower body tends to follow the genetics of my mothers side. She had alot of problems with her health including poor circulations and RLS which she always said her legs felt like they were filled with concrete, when I workout or use the stairs I can completely relate to that feeling. I have tried many ‘fad’ diets/pills including the recent fad of Garcinia Cambogia, and Forskolin, but the thermogenics were always my go-to because they seemed to work, but because they made me sick I would stop taking them. I have walked and done some running through the years but this activity aggravates an old knee injury and gets really painful when the weather is cold. About 4 years ago I started doing yoga and some of the Beach Body video workouts like 10 Minute Trainer, P90, Insanity and the Les MIlls Combat Workout. Then in the spring of 2013 they offered a Cross Fit Boot Camp workout where I work so I was involved in that for 6 weeks. Through all of these programs I never lost more than 5 pounds and never saw a physical change except in my upper body. Once the 6 week Boot Camp was over I continued to do cross fit type workouts either with a small group at work or on my own until I re-injured my lower back in October 2013 putting my workouts on hold for about 3 months (I tore the outer layer of the disc just above my tailbone so it wasn’t a full rupture but the Dr wanted me to hold off on everything but walking until it was healed so it didn’t tear through). In March I came across the Venus Factor and decided to give it a try, I was into the 2nd week of the workouts when I tweaked my back again. At this same time my dad’s health was failing and I devoted all my time outside of work to him. After he passed away at the end of July I decided it was time for me to give it another try. The workouts. They are designed to work for a women’s body, and they do! Also the online community support. Which workout(s) did you use during the contest? What did you enjoy about those workouts? The Venus Factor 12 Week Fat Burning & Muscle Toning Workout. It was a full body workout that was a nice variety that I was able to do on my lunch hour. Did you use a particular style of eating? What was your nutrition strategy? Some ESE days mixed with deficit days during the week, maintenance on the weekend. I find I loose weight easier if I stop eating in early afternoon with nothing until the next morning. Although this is really hard & takes A LOT of willpower, this is what seems to work for me. Sometime I’d bank calories for a special event. I also looked at the calorie intake by the week, not the day. I tried to get my protein up to 80 grams per day. Although I did hit it a few times I do get closer to that goal as more often now than when I first started. 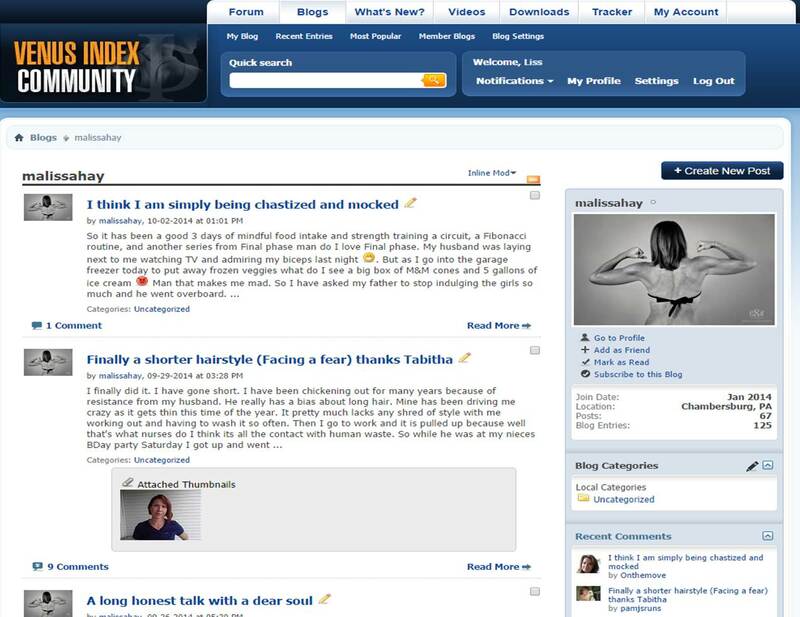 Did you use the online community and if so, how was your experience with it? Yes, it takes a bit to learn to navigate but it’s worth it. Everyone is so positive and supportive, sharing tips and suggestions, and what has worked for them. It’s never like a catty competition against each other we are all out to do the best we can and help others be successful as well. Food! I still have a lot to learn. At first it was the contest, knowing that I had a deadline. Also the online community. Then towards the final few weeks I started seeing a real physical change, the reshaping had started to show, it was subtle, but when I took my weekly tracking picture and put them next to my before pictures the change was amazing! I finally found something that was really working! One word; AMAZED! I still can’t believe it is me! I have always had low confidence and a distorted body image, but I am actually starting to see the change in the mirror, I just have to convince myself that it is real! What advice do you have for other women going through the contest or considering the contest? Just do it! The program really does work, you just have to give it a chance. It doesn’t happen overnight, and you do have to put in the time and effort, but you will get out what you put in. This is a program that is designed for a woman’s body, unlike anything out there is truly is a “shaping” system. With all the workouts I had been doing this is the first one that has actually reshaped my lower body, in just a short 12 week span the change is amazing! I believe in the Venus Factor system so much that I have become a true insider and became an immersion member, on to the next phase! 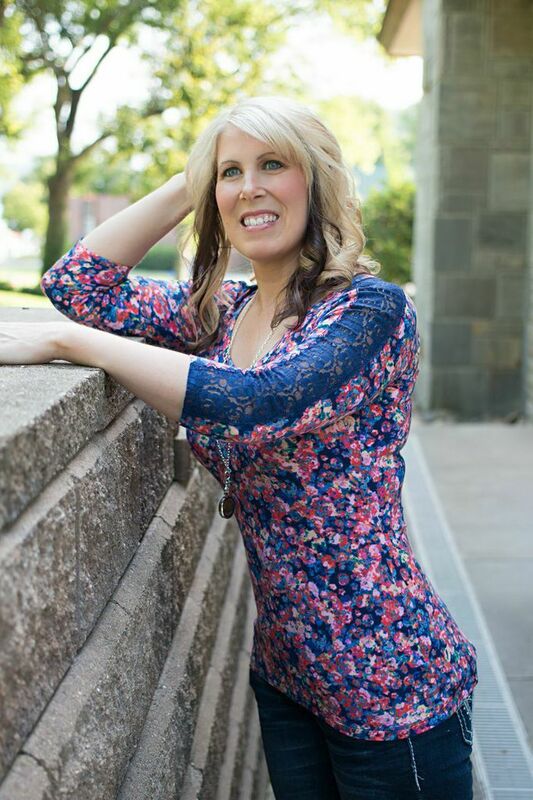 You can find Wendy active in the Venus community and read her blog! Wendy lost 9.0 lbs and 3.0 inches from her hips during the 12 week contest! She works as a nurse on the night shift and is a busy mom, despite these obstacles she still was able to transform her body and mind in spectacular fashion during the contest! Wow is all I can say. I accidentally clicked on this ad on facebook six months ago and its the best mistake I’ve ever made. Went into this with no expectations just wanted to lose 20-30lbs and discovered I love weights and I’m so mad at myself for having a gym membership and using it for cardio classes. This program has helped me get to a level of fitness that I have never had in my entire life. The program has changed my life forever and helped me find a new passion. I am a night shifter; I work 12 hour shifts 7pm-7am 3 nights a week on a very busy medical floor. I fell into the trap of mindless eating like many people do when they work shift work. Many times you eat to stay awake or you are just hungry for no reason. And you work with other people in the same boat who believe they are overweight because of the shift they work and lack of sleep screwing up their metabolism. But there are people who work these shifts and don’t have an obvious weight problem. So as I started Venus factor I had to take into account I would be eating 1000 calories on most days and I would have to keep to that deficit even on the nights that I worked. So I planned my meals out in advance I would fast until 3 or 4pm on days when I was working. I would many nights eat my dinner and snacks by 11 or 12am and just drink coffee, tea, energy drinks, and diet soda after that (caffeine is the sidekick to a night shift nurse). I packed my lunch and avoided the hospital cafeteria like the plague. I would try and save maintenance days for when I knew co-workers were planning on bringing in food but many times I had to pass because someone is always bringing in cake for no apparent reason or quick high calorie snack items and happy to share. I have become a foodie with protein powder so I made a lot of desserts that I could have and brought them into work and let my co-workers test them out too. I am a big fan of the mind set of “Eat what you love everyday” if there is something you love research it find a lower calorie version and make it yourself. But honestly many times you just have to learn to say no and walk away because it is not part of your ultimate goal, and no food tastes as good as being able to fit into the clothing you want feels. So if you are doing this and you work these crazy hours like me know that it is possible. Logging and planning ahead were my biggest tools I had flops nobody is perfect, you just have to make sure flops are not a consistent part of your routine. As for food choices protein and low carb are better friends to night shift if you eat high carb it actually contributes to your fatigue and sluggishness. So I found that avoiding the grains and high sugar foods helped with my energy levels along with all the caffeine. Now as I am in maintenance I tend to find I have better luck with eating a little lower on days where I am home and eating at maintenance on nights when I work. 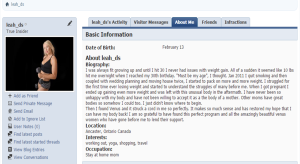 You can read her blog here and interact with her in the community. I came across the Venus Factor on Facebook after the holidays when I was beginning to gain some weight back after a long streak of slow weight loss with calorie reduction and taking group exercise classes 4-5 days per week. I watched the brief video and thought it kind of made sense. I liked the cost of the program and decided to give it a try. The aspects of the program I found most beneficial was that it was electronically downloadable and I didn’t have to wait for anything in the mail. I could start pretty much right away. I liked the mobile version that I could take with me to the gym so I could access any videos of exercises I was doing that day. I love, love, love these workouts they provided a variety that keeps me from getting bored. They really helped with my core strength which I needed desperately suffering from lower back pain on/off. They make you look taller more confident and really help you achieve strength to do things that many women don’t find easy like pushups, pull ups and I think I might actually be able to climb a rope now. I used the original Venus workouts at the beginning then moved onto Final phase and I was into Phase 3 at the end of the contest. I also used Slim in 7 pre photo prep. Now I have moved back into Final Phase with Venus Circuits and Specializations on off days. The thing that kept me motivated was that my weight loss was actually noticeable more to others than myself. Even my husband noticed. I was losing a clothing size about every 2-3 weeks it seemed, I started off at a size US 12 and was in a size 4 by the time the contest photos were submitted. I was also motivated by the things I was actually able to do when I got down to a smaller clothing size. I could actually support my own body weight and it was no longer difficult and awkward to do activities like running and spins and turns with ballroom dancing. Style of eating… hmm… I really like a variety of foods I am a big fan of cottage cheese, greek yogurt & I never seem to get bored with chicken. I will say that the intermittent fasting technique opened my palate up to try vegetables that I might have passed my nose up at before. Bottom line if you are truly hungry you will eat and these are the times when I introduced a new food to my taste buds. Did you use the Undulating protocol? If so how did it work for you and did you make any modifications? I used the undulating protocol for the 1st and 2nd round of Venus. The 2nd round fell during the summer so I moved my maintenance days to fit with cook outs and date nights. I use whey protein powder if I am getting behind on my protein requirements. I have recently discovered the Quest bar (yum). I like to make my own food and manipulate recipes so I can increase the protein and still try and keep things low on the calorie counts. I was taking raspberry ketones and green coffee bean at the beginning but stopped and guess what the weight still came off so I don’t waste my money. I just do a women’s multi-vitamin and natural progesterone cream to correct some estrogen dominance that can interfere with my appetite. 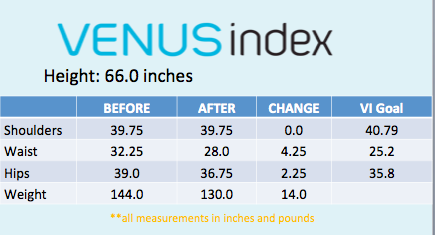 I started blogging after I had been doing Venus for 6 weeks and already started seeing results. I went on the blogs and saw all of these incredible pictures of women and the noticeable changes that were happening. 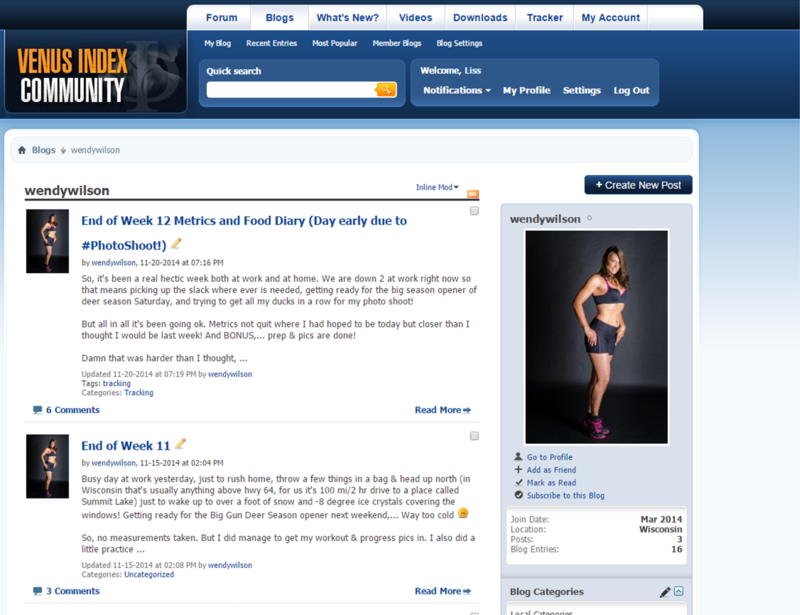 The blogs are great it is like your online support group because you will truly need support. No one else around you will probably be doing this and when you give them details that is when they give you there unsolicited advice and it gets very old very soon. My husband was on/off with the support wagon he gradually accepted that I had become someone different. He really didn’t like me going to the gym and leaving him so then he joined the gym. Once the scales tipped in our relationship he felt the need to change as well. Most everyone has been very encouraging and supportive of me. I did have a couple times when people would pig out in front of me and laugh about it. I heard a couple anorexic comments people love to throw that out. The hardest obstacle during this process is when I reached a size 4 for me that is something I really could not believe when I ran into Old Navy grabbed a pair of pairs put them on and they fit perfect. I was never even this small in high school. My final pictures I had done Slim in 7 and is started to get pretty miserable by the last 2 days. But I would say it was well worth it. I love my VT11 pictures they are the best pictures I have ever had taken. I can’t believe that I am able to look at myself in a bikini none the less and not want to cringe or pick my body apart for everything that is wrong with it. I look balanced, lean, strong, and confident. Actually, I look even better than I did before I had 3 kids! This is absolutely a lifestyle I will continue. I love weight training. I now have so many workouts to choose from because of Immersion. I may not always track but can always go back to that tool as well as many of the others. I now have an understanding of how I got to be obese and how very easy it is to do. I now also possess the knowledge of how to correct the situation and prevent it from getting to that point again. Malissa is a total Venus! 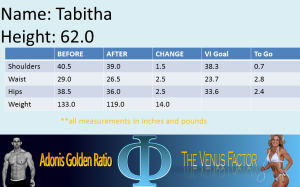 Tabitha placed in our recent VT11 Venus Transformation Contest. She did a phenomenal job, and persisted through some hardships. Her results are wonderful! 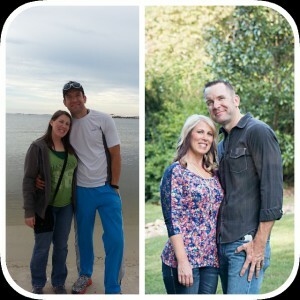 I started my weight loss journey in Jan 2012 with my husband. I did not know about Venus at the time and just counted calories using MFP. By April of that year I gave up. I had only lost 15 pounds and my husband had lost over 30! I was so frustrated because it didn’t even seem like he tried and the weight just fell off, but I was constantly hungry and felt deprived! By 2013, I had gained all the weight back so I decided to try Weight Watchers. I could have all the fruit I wanted so I wouldn’t be hungry on this system right? By July of 2013 I had gained an additional 12 pounds! I was now the heaviest I had ever been. I knew I needed to do something, but just dreaded being hungry ALL the time. My husband had joined Adonis that year and joined one of the contests. I was very skeptical and was sure that skipping breakfast and only eating 1000 calories was very unhealthy! When I saw his after photos I was blown away! He finally convinced me to just give Venus a try. I signed up December 31st and started in January. The most surprising thing to me was that I could skip breakfast and I was fine! By skipping breakfast I had more calories for later in the day and I wasn’t starving by lunchtime like I normally was when I would eat breakfast! The 1000 calories that I was worried about? Now I routinely only eat 800-850 and I feel just fine! I don’t go to bed hungry. I feel full and even save enough calories to have a bowl of ice cream before bed most nights! The workouts have been the most challenging aspect of my journey. Six weeks in I started having pain in my knees. I had to completely cut out ALL leg exercises from my routine! I was so discouraged, but the ladies in the forum kept me going and gave me ideas for alternate exercises. I still can’t do most of the exercises, but through the forum and my physical therapist I have enough alternatives to get a good leg workout! I have learned that if you truly want something you will find a way! You just have to keep a positive outlook and keep going! If one way doesn’t work then try something else. Eventually you will find what works for you! This has been a true lifestyle change for my entire family. We no longer shop the way we used to, we find ourselves primarily shopping along the outside aisles of the store…no more boxed & processed food. We weigh & measure everything we eat. We very rarely eat fast food anymore and we don’t even miss it! Even my 11 year old daughter has started making healthier food choices (on her own) and she has started working out with me in the evenings! 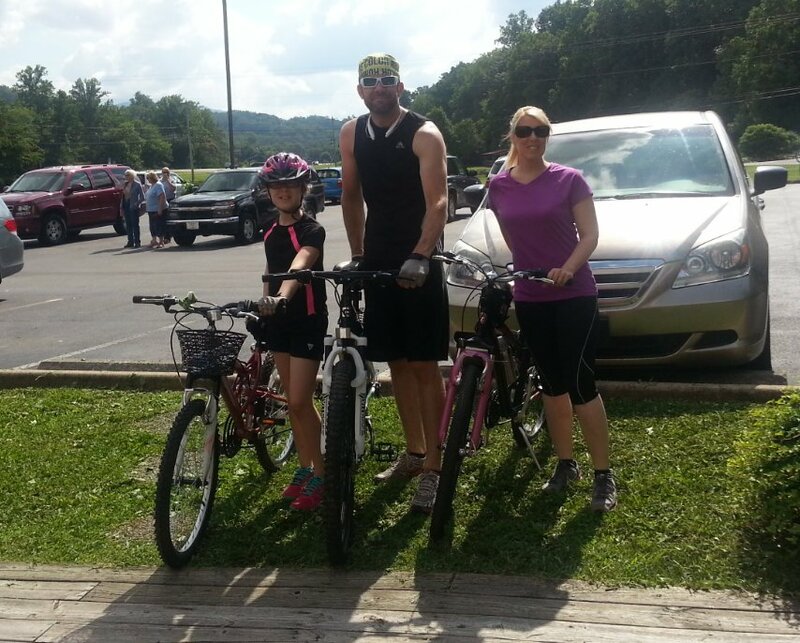 We have started cycling has a family and have gone several times over the summer. We have truly changed our lives thanks to Venus and Adonis! 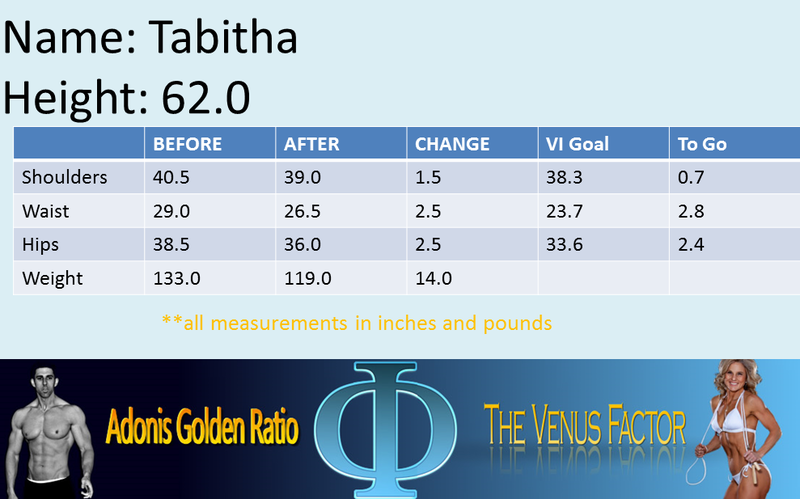 You can find Tabitha active in the Venus community and read her blog! Through my husband! 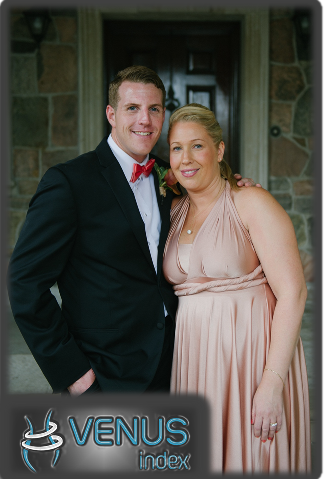 We started our weight loss journey together in 2012. I gave up 3 months in, but he kept going. In 2013 he found Adonis and joined a contest. He placed 10th!!! I was very skeptical of the Adonis program when he started…skipping breakfast, eating low calories…it couldn’t be healthy…right? When I saw his after pictures I started to get curious. Finally at the end of December I thought “What have I got to lose?” and signed up! The science behind how to lose weight is what I found most beneficial. As I read the weight loss manual I kept thinking “Wow! This is what I did wrong before! That is why I was always hungry, etc.” I have tried counting calories before but I failed. In 2012 I used MFP to count calories. I stayed below 1200 every day. However, I always felt hungry and after 3 months I just couldn’t maintain it anymore. When I saw that my deficit calories with Venus was 1000 I thought there is no way I can do that! I was starving eating 1200 with MFP how could I possibly eat 1000 or less? With Venus I learned that eating breakfast was my first mistake. I skip breakfast every day now and I don’t even miss it! My second mistake was eating low every day! Having the maintenance day has really helped. If I am craving something through the week I just wait and eat it on my maintenance day! I never feel deprived and most days I only eat between 800-850 calories and I never go to bed hungry! I love the workouts! I have never lifted weights before in my life! When I tried to lose weight in 2012 I would walk every day. After a while though that got to be really BORING! I tried workout videos, but gasping and panting for breath after 10 minutes is not my idea of fun! With the Venus workout it is different every day and while I sweat and sometimes breathe hard I never feel like I am dying! I have stuck with the Phase 1 workout. I have had to modify them a lot due to some knee problems though. The online community has been my biggest motivator. Reading all the stories and seeing the pictures of all the successful Venus women has given me goals to work toward. Every time I have felt discouraged or would have given up someone is always there to encourage or give advice. I really don’t other than that I tend to eat the same foods every day. I find that it is easier because I know the calorie counts in the foods I eat. We have 5-6 meals that we rotate out for dinners. I did not use the undulating protocol. Through this journey I have learned a few things about myself. I am very much a type A person and will try to make things more difficult than they are and if I feel that I am not doing something perfect then I will quit…rather than risk failure! Knowing this about myself I decided to just keep things simple and only track my calories and protein. Trying to track carbs, fat, and work out percentages was just too complicated for me and I knew that I would not stick to that and would give up. Very frequently! I love the online community and find myself checking that site before Facebook even! I have several women that I follow regularly and I hope to meet a lot of them one day face to face! I have! I don’t know if I could have stuck with the workouts if my husband was not getting up with me at 5am to workout as well! The hardest obstacle for me was the workouts! A few weeks in I started having pain in my knees. After several visits to the Orthopedic, x-rays, MRI’s, etc. the Dr said he had no idea what was causing the pain. However, my Physical Therapist has been working with me and I now have an arsenal of alternate exercises and the pain has gotten better. They are not completely healed and maybe never will be, but at least I can still strengthen! This lesson has taught me that there is always a way! I couldn’t believe it! I still look at them and say “Is that really me?” I am very proud of what I have accomplished this year! Definitely!!! This journey has been a complete lifestyle change for my entire family! We now spend our free time being active. We have started cycling and try to go every chance we get now. I have more energy and feel more alert. I never want to go back to the old me! I want to change my family tree and pass this healthy lifestyle on to my child and have her eventually pass it on to her children! What is your best advice for other Venus’s? Always keep a positive attitude! The thoughts you tell yourself really matter! If you are constantly telling yourself that you are weak, you can’t resist high calorie foods, you are tired and can’t workout, etc. You will believe it and set yourself up for failure! Instead speak positive words or words of life to yourself! Even if you don’t “feel” beautiful, strong, or worth it, tell yourself that you are and eventually you will believe it! Surround yourself with positive people. You don’t need people in your life that only speak negative things into your soul! These people will tear you down not build you up. There really is power in your thoughts and words! Tabitha lost 14.0 lbs and 2.5 inches of both her waist and hips during the 12 week contest! 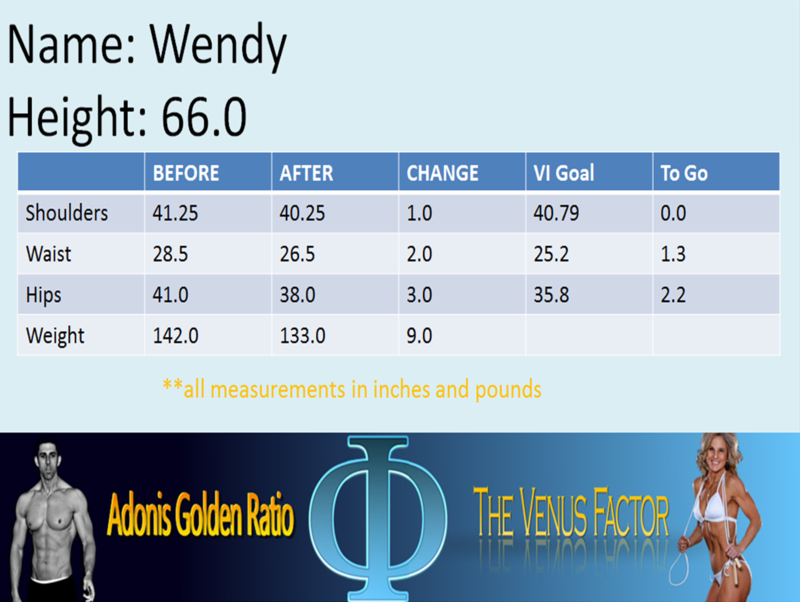 Note: The Adonis Golden Ratio is the men’s version of our fat loss and muscle building program. Many Venus’s husbands and boyfriends use this program. We are starting to get requests for a “couple’s contest” so if there is enough interest please let me know and we can roll that idea around. Isn’t Tabitha a beautiful Venus?